Brand New for Christmas 17 is a Christmas Hamper personalised with your brand, message or logo. • 5 round cookies bearing your brand message or artwork. 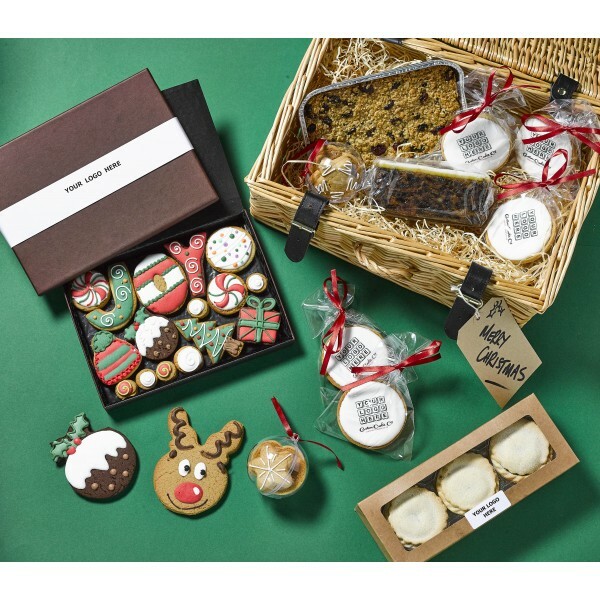 The Joy Gift Box and Mince Pie box can also carry your brand, message or logo. A single artwork file should be provided which will be printed onto the gift box banding strip, on the mince pie sticker and on the 5 logo cookies. A blank tag is provided on the outside of he hamper on which you can write your own special message. There is a minimum order of 10 customised/ branded hampers.